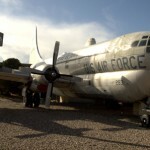 The Airplane Restaurant outside of Colorado Springs is a great idea. Park a plane outside an existing restaurant, theme both as an airline and watch customers come from miles away to “take a flight.” Unfortunately, we’ve watched enough of Gordon Ramsey’s televised rants to know that even if you have a cool theme (which the Airplane Restaurant does) and a quality location (which it also has), you’ve got to have edible food at a reasonable price – both of which the Airplane Restaurant does not have. Even the converted fuselage and in-tact cockpit of the military KC-97 tanker is immaculately detailed to provide both a flight and dining experience. But, that’s where the theme falls apart a bit. The staff is nice enough, but this restaurant draws the family crowd, and just like a real flight, the screaming of children echoes pretty effectively inside the tin can. The service is slow, not solely due to the the staff (though they did play a part) but because the kitchen and bar remain in the main restaurant, down a flight of stairs. They have to trudge there each time you need a refill – not very efficient. Then there’s the food. Think Mitt Romney here. Bland, unseasoned, and mostly made for the conservative senior palette. Unfortunately, it’s also overpriced. If you have kids, it’s the place for you. If you don’t have kids, go to Applebee’s.